Modern agriculture, especially in the tropics and sub-tropics, has largely ignored the importance of maintaining soil carbon or humus levels. Soil carbon is vital for the maintenance of fertility and greatly improves retention of moisture. Developing sustainable agriculture in warm climates will require a strong focus on soil carbon levels. If broad commitments are made to building and maintaining soil carbon levels in farmlands very significant amounts of carbon will be sequestered in the process. Soil carbon is present mainly in top soils. It is mainly top soils that are lost to erosion most especially in heavy rains. A range of strategies, including incorporation of crop residues, can build soil carbon levels, however, these levels can only be maintained if erosion of top soils is arrested. Foliage from vetiver hedges may be harvested to build soil carbon. Loss of topsoil seriously threatens agricultural production in many parts of the world. Topsoil erosion occurs mainly on slopes and in flood zones. Most erosion occurs during storm events. Storm events are predicted to increase in intensity and frequency as a consequence of global warming. Vetiver hedges, more than any other single strategy, have the proven capacity to dramatically reduce soil erosion on slopes and in flood zones. On Slopes: Vetiver is closely planted in contour hedges, which trap eroding top soils and harvest rainwater. Over time accumulating top soils build fertile terraces behind the hedges. Hedges are spaced according to the steepness of the slope and other site-specific factors. Vetiver survives drought and fire. In Flood Zones: Vetiver is closely planted in hedges perpendicular to overland flows during flooding. Vetiver’s strong, dense foliage reduces water velocity and traps sediments reducing soil erosion and sedimentation of waterways. Vetiver survives immersion for several weeks. 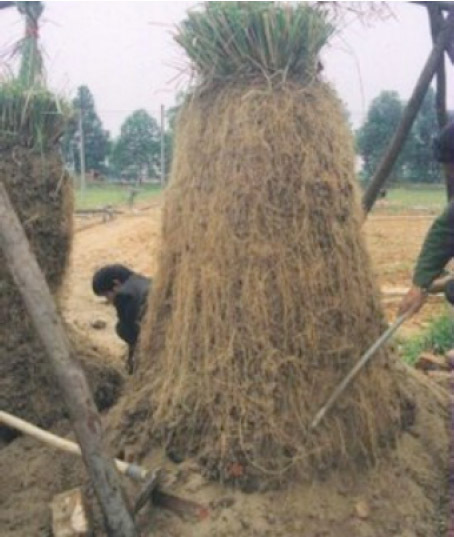 Vetiver grass produces a massive and very deep root system. Precise methodologies to quantify the amount of carbon sequestered in vetiver roots are not yet available, however, it is clear that the enormous root mass does store impressive quantities of carbon in the ground.